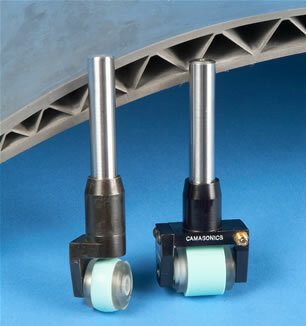 Roller Probe Transducers are a dry coupled transducer used with a through transmission technique for scanning large areas in an automated system or smaller areas using a hand caliper that can be provided. Roller probes are typically used in the aerospace industry for the inspection of honeycomb and composite panels and wing sections. These probes consist of an anodized aluminium body, Perspex wheel with sealed bearings to prevent leakage of oil and a soft but wear resistant rubber tyre. The element is a low or undamped lead zirconate, offering both good penetration and an excellent signal to noise ratio. 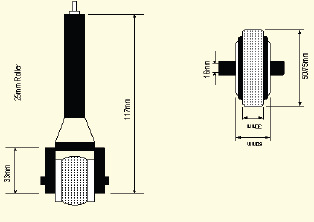 Two sizes of transducer are available, the 25mm diameter which can be held in our own caliper unit or the 75mm diameter to fit individually tailored fixtures. Used where dry testing is a necessity in through transmission mode of highly attenuative materials.